This is an initial exploration into the use of the PCC ontology as a conceptual framework within which to conduct analyses of issues and phenomena that involve perception, cognition and communication. Here we explore the underlying causes of two general perspectives, one a naïve realist perspective and the other a non-naive realist perspective, which is referred to here as unified realism. Consider the twoTopics pattern illustrated below. If we interpret it a little we can see an example of a simple cognitive structure within which an experiential process operates. From right to left there are two objects (in this example the objects are publicStates but they can be any phenomenon), two observables, two concepts and two representations. All of these are phenomena and can therefore also be an object within another cognitive structure. Hence a cognitive structure may be about and an experience may be of a state, an observable, a concept or a representation. 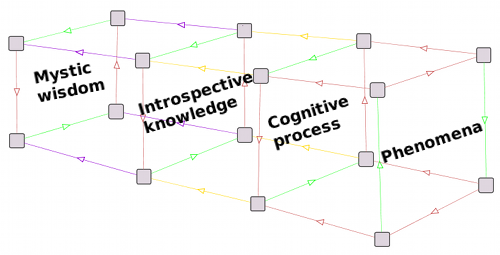 Let us use this as a simple representation of a general cognitive structure in order to graphically describe other cognitive structures (and experiential processes) which are far more complex but still exhibit the same basic structure. Below is a simplified diagram that shows the basic structure and process of a system's experiential process. Imagine that the two entities and two relations shown at each stage are actually far more complex and the above diagram represents a system's entire experiential process. I.e. the objects symbolise the set of phenomena that the system experiences, the observables symbolise the set of observables, the concepts symbolise the system's conceptual framework and the representations symbolise the set of expressions that the system makes. Note that a representation or expression is not just a word but could also be a memory or any form of symbolic encoding. This is all just so that we can talk about two different perspectives whilst using the basic structure shown in the above diagram as an analytic tool. Keep this diagram and general process in mind throughout the following discussion. Firstly a naïve realist scenario where the focus is on the objects, which are assumed to be actual entities that exist exactly how they appear. The object can be either an externalPhenomenon such as a publicState or representation or it may be an internalPhenomenon such as an observable or concept. However there is no focus on the experiential process itself, only on the content of the experiences. The observable, conceptual or representational aspects of the process are entirely overlooked and confounded with the object. Hence a naïve realist unknowingly uses the observables, concepts and representations to experience, comprehend and express their occasion of experience, assuming that the content of the experience is the actual reality. The content of experience may be of any phenomena but the process of experience is completely overlooked. A unified realist is a non-naive realist who comprehends both the entire experiential process as well as the contents of experience. There is awareness of the objects (which can be any phenomena) but there is also awareness of the observables, concepts and relations and how they participate in the experiential process. 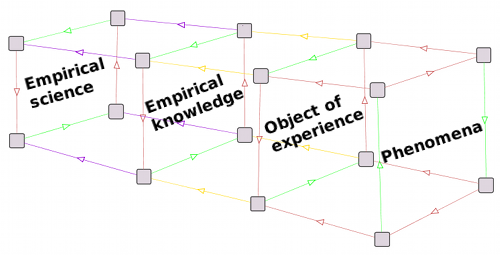 A unified realist knowingly uses the observables, concepts and representations to experience, comprehend and express their occasion of experience, knowing that the content of the experience is just that, the content, and that the experiences themselves arise from a deeper process, which animates oneself and all systems. These are two extreme scenarios and there is a spectrum of scenarios between them which comprise different proportions of focus on either the content of experience or the experiential process. Below are two diagrams of the two extreme cases. Consider the first diagram, say a naïve realist experiences some phenomenon that produces an observable that they experience as being red and spherical, they then conceptualise this as a red ball and describe it using the phrase “red ball”. Without any awareness of the experiential process itself they confound the object, observable, concept and representation, not realising that they are different. Then they confidently point to the phenomenon and say: “there is a red ball”, and they firmly believe that this is all there is to the situation. Now consider the second diagram, say a unified realist experiences the same phenomenon and it also produces an observable that they experience as being red and spherical. However, now there arises a parallel cognitive structure, with the red spherical observable as the object. This leads to an awareness that the experience of red-spherical is an observable of some phenomenon and not the actual phenomenon itself. The original cognitive structure evolves informed by this knowledge that the red spherical observable is a cognitive process and not the actual phenomenon itself. Next in the original process the red-spherical observable is conceptualised as a red ball. Again a parallel cognitive structure arises, with the red ball concept as the object. This leads to the awareness that the idea of a red ball is a conceptualisation of an observable that is red and spherical. Next in the original process the concept of red ball is represented as the phrase “red ball”. Again a parallel process arises that leads to the awareness that the expression “red ball” is a symbolic representation of the idea of a red ball. Most systems are naïve realist – they respond to their experiences assuming that these are the reality. It takes a high level of awareness to overcome naïve realism. Most humans are largely naïve realist, however with appropriate effort this can be overcome. It requires cognitive training of which there are many varieties. Simple inner watchfulness prepares the ground. The observable form of a system is its outer aspect and its experiential process is its inner aspect. All systems have both inner and outer aspects. I am a system within a systemic context, hence I have both inner and outer aspects. All things are systems within a systemic context, hence all things have both inner and outer aspects. If a system had no outer aspect it could not be experienced by another system. If a system had no inner aspect it could not experience other systems. All system interactions involve systems experiencing and responding to each other. I can experience my own inner aspect in the sense that the experiences themselves are how that inner aspect appears to me. There is a structure to the process that can be discerned with careful observation. If there were no inner aspect I would not experience anything at all and when my experiential process changes this effects the content of the experiences. I cannot experience the inner aspect of other systems directly, just as they cannot experience mine. The inner aspect (system process) is private whilst the outer aspect (system state) is public. Any public state can be observed so long as an information channel exists via which it can be experienced. An observable is conceptualised based upon the pre-existing conceptual network. A concept is represented based upon the pre-existing symbolic 'language'. When we experience something we experience our own response to some stimuli, we do not experience the stimuli itself. We have no direct access to the stimuli itself, but we do have direct access to our own inner aspect. What we experience is a product of the experiential process. We can develop awareness of our own experiential process and then use this to inform the entire experiential process, thereby clarifying the lens and germinating the seed of wisdom. When a system focuses solely on the content of experience it will only have information channels informing it of the objects (naïve realism). Whereas when a system focuses on the whole process they have information channels informing them of objects, observables, concepts and representations (unified realism). These two different focuses lead to two different perspectives, however inner watchfulness opens up the information channels that give one awareness of one's own experiential process and can help to overcome naïve realism. A naïve realist has no awareness of the experiential process so to them the content of experience is the whole of reality. A unified realist has awareness of the experiential process as well as the contents so to them the absolute reality is consciousness (which animates all things) and the relative reality is the world that is portrayed by the contents of consciousness. A naïve realist experiences only objects of experience, which they confound with the phenomena itself. However a unified realist experiences both objects of experience as well as the fact that they are observables. A naïve realist conceptualises their observables without realising that they are concepts, hence the concept is confounded with the observable and the object. However a unified realist conceptualises knowing that the concepts are concepts and not the phenomena itself. A naïve realist makes expressions without realising that they are expressions, hence they confound the expression with the concept, observable and object. However a unified realist expresses themselves knowing that this is a symbolic representation of concepts. In this way a naïve realist assumes that they are experiencing reality as it is and that the contents of their experience accurately represent the actual reality. However a unified realist knows that they are experiencing things because of an experiential process which is part of a much deeper and unified process that animates the entire manifest universe (see SMN ontology). Hence the contents of experience give a perspective on the appearances of things, but the process of experience itself is our direct connection with the universal animating principle of existence. By clarifying our experiential process our overall experience of life becomes deeper and richer and the deeper we go into ourselves we more we connect with the underlying substrate of existence. It is therefore understood that the fundamental reality can be thought of as a field of consciousness, but it appears to the senses as objects in space and time. The network of interconnected experiential processes is the field of consciousness and the contents of experience are the world (which is believed to be objective but is in fact subjective). Hence, as the Buddha (a unified realist) said, “with our thoughts we make the world”. The contents of experience still have meaning and provide useful information, but they are not the whole of existence, they are the contents of our minds. We also need an awareness of the process of experience in order to put these contents into context and thereby understand the overall situation.